Peer groups form the bedrock of many company pay-setting exercises. Benchmarking CEO pay to a target value, typically the median pay of a group of “peer” companies, is a standard practice used by compensation committees; more than 97 percent of S&P 500 companies disclose benchmarking peer groups. And while there was once significant skepticism among the investor community due to perceived peer group manipulation (typically companies selecting many larger companies or “aspirational peers,” leading to escalating executive pay), most companies seem to have reformed their peer group selection practices. In this article, we provide an alternative look at peer groups using the “wisdom of the crowd” – that is, the network of companies formed by examining the peer selections that other companies are making (and specifically ignoring the peer selections made by the target company itself). 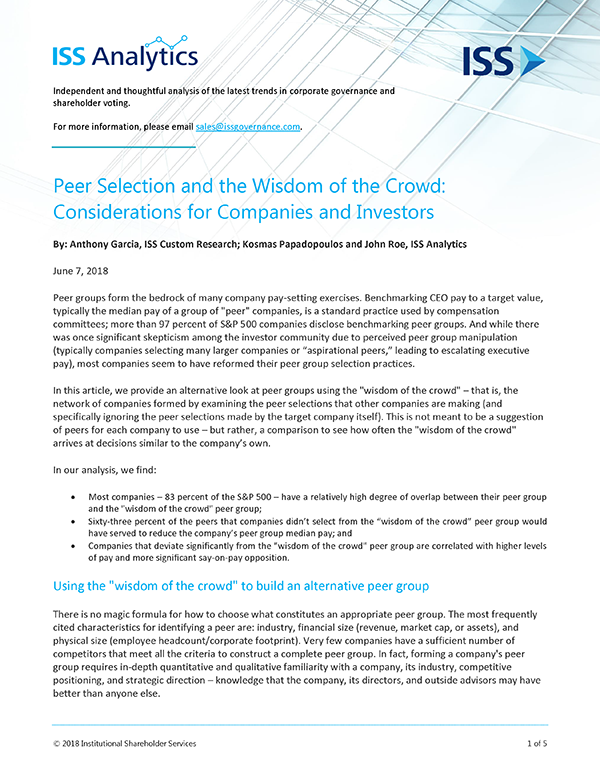 This is not meant to be a suggestion of peers for each company to use – but rather, a comparison to see how often the “wisdom of the crowd” arrives at decisions similar to the company’s own.